Austin is no stranger to competitive cycling. It’s a great whole-body workout and offers numerous cardiovascular benefits. But one thing it doesn’t provide? Better bone health, according to some experts. 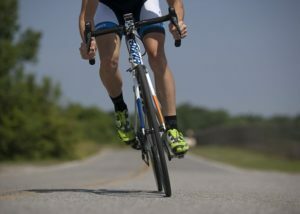 A recent study published in BMJ Open Sport & Exercise Medicine revealed findings of a bone health comparison between professional cyclists and runners…and the cyclists got beat. Researchers were intrigued with the effects of low-impact (think cycling and swimming) versus high-impact activity (like running or basketball with lots of jumping/landing) on bones and bone density. The study conducted by the Norwegian School of Sport Sciences evaluated 21 runners and 19 cyclists all with extensive experience competing with regard to their training, overall health, and calcium intake. Individuals in the runners group voluntarily added more hours of weight-lifting and strength-training to their regular running regimens over cyclists and their cycling training. The two groups had noticeably different bones. As a group, the cyclists all had thinner bones than the runners, and more than half met criteria for low bone mineral density. People with low bone density are highly prone to osteoporosis, causing bones to become very brittle and susceptible to serious injuries like fractures. The study suggests that the heavier impact of striking the road while running strengthens and conditions bones more than the gentle motions of cycling. Our board-certified rheumatologists, orthopedic surgeons and sports injury doctors in Austin say that cycling is still a great and safe sport, but adding more weight-bearing exercises to your workout—and even weight-lifting—may be a good idea to promote better bone health. If you have questions or concerns about your bone health or which exercise is right for you, you can contact us anytime online to schedule an appointment with one of our specialists right here.